Congress president Rahul Gandhi will decide who the next Chief Minister of Madhya Pradesh will be. The elected MLAs from the Congress party unanimously decided in a meeting held on Wednesday that it is best to leave the critical decision in the hands of the 48-year-old Gandhi scion who is now being feted for leading his party to major victories in three states. “All the MLAs have unanimously decided that a decision on the Chief Minister (of Madhya Pradesh) will be taken by Rahul Gandhi ji,” Congress leader Shobha Oza said in Bhopal after the Congress Legislature Party (CLP) meeting. Gandhi, who took charge as the Congress president only a year ago, will now have to pick from among Kamal Nath, Jyotiraditya Scindia and Digvijay Singh. While Digvijay Singh is a former Chief Minister of Madhya Pradesh, Kamal Nath is a senior politician whose organisational skills as Madhya Pradesh Congress Committee president helped the party immensely. On the other hand, Guna MP Jyotiraditya Scindia is being hailed for being the driving force that led to the re-emergence of the Congress in the state after 15 years. At a press conference held after stacking claim, Kamal Nath responded to a question on who could be the CM with a terse “I don’t know”. After the meeting with the Governor, Scindia said “of course it would be a privilege” when he was asked whether he would like to be the Chief Minister. 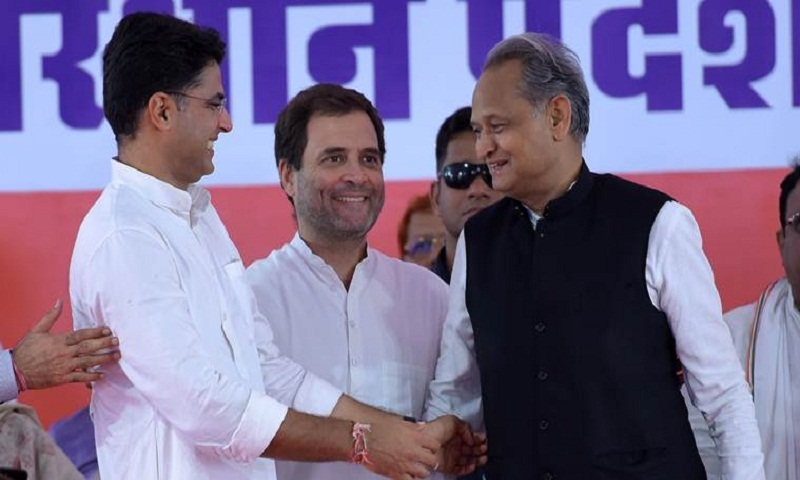 Scripting a new narrative of its revival and resurgence in the country’s politics — especially in the crucial electoral politics of the Hindi heartland — just ahead of the upcoming Lok Sabha elections, the Congress party had earlier on Tuesday wrested two states, Rajasthan and Chhattisgarh, from the BJP. The outcome of this round of Assembly polls, which could be a bellwether for the coming general elections, clearly boosted the leadership profile of Rahul Gandhi. Buoyed by his party’s victory in the Hindi heartland, Gandhi, who had vigorously campaigned in these polls dubbed as the “semi-finals to the 2019 general elections”, said their outcome was a “clear message” to the Modi government that people were not happy with it and that it was “now time for change”. The Congress won 114 seats in the 230-member MP assembly, just two short of the majority mark. Earlier today, both Bahujan Samaj Party, with its 2 seats, and Samajwadi Party, with a single seat, extended their support to the grand old party. All of the four Independents who won the election, too, went with the Congress thus bringing the total number of the alliance to 121, reports The Statesman.